Another of the really amazing buildings on Portage Ave is the former Birks building. 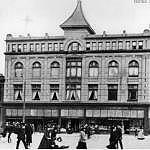 It was originally built in 1900-1901 as Winnipeg's first YMCA. It had a massive strong textured limestone façade on 2 sides it had a lot of ornamentation a lot of Romanesque ornamentation. It looked a lot different than it does today. Once it was constructed the YMCA became extremely popular. It was soon bursting at the seams, when the YMCA left in 1912 of course they had to find another buyer for their former building. They found a perfect match in the Birks Jewellery Company. Henry Birk had started in Montreal and Birk really wanted to be on Portage Ave. Just like everyone else. But he didn't want it to look like the old YMCA building. 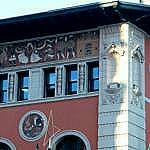 He hired Percy Nobbs of Montreal to create a beautiful frieze on the front and the side of the building. It's a magnificent mixture of and terra cotta tile and mosaic tile. The frieze tells a number of stories, actually. Lower on the frieze there are medallions of terra cotta and they depict the materials used by jewellers. There's an elephant for ivory. There is a man diving for pearls. There are miners so that kind of tells the story of the jewellery trade. It's a magnificent piece of art. Unfortunately right now it's one of the vacant buildings on Portage Ave.
NAR: While parts of Portage Avenue's past have been lost, they have been relatively few. One old building that succumbed is the Time Building. The day that the time building burned down, I can remember it quite vividly because we lived next door to the family called the Redmonds and they owned JJH McLean's and they occupied the ground floor of the Time Building. About 6:00 in the morning their son called to me and banged on the door and said come on we are going down to watch a fire. And it was raining and it was blowing it was a really hard, hard wind blowing the rain. This is what caused the fire the moisture and force of the wind forced the moisture up into the sign and it caught on fire and started the building. They tried to put the fire out and were unable to do so. Eaton's had its own fire fighting system its own wells and they were able to put a curtain of water down the front of the building and on the side of the building on Hargrave St to protect their own building. If they had not done that they say the heat of that alone Eaton's would have caught on fire that day. It was quite something to see that building going up in flames In the middle of a rain storm they couldn't put it out.